Hi there, everyone!! Are you excited for day 3 of the April Lawn Fawn sneak peeks?! I think the design team did an amazing job with Fanciful Frames yesterday, and there were so many different styles and uses of them!! Gotta love that! Today we are showcasing a brand new alphabet set that I just know you are going to love!! It has a bit of a typewriter look to it, and is really clean as well!! Scrapbookers- this set will be perfect for journaling, and adding subtitles to your layouts. Card makers- you can create pretty much ANY sentiment you could ever want with this set, and that is just awesome!! It would look really awesome inside of a Fanciful Frame as well....just sayin'. Tee hee! Instructions: Fold red cardstock in half to make card base. Punch an upper crest border to the bottom of white cardstock block, and adhere an aqua scalloped paper frill to the top. Tie size pieces of rainbow colored twine around the block, and arrange as shown. Stamp the sentiment to the bottom of the card, and then adhere the entire twine block to the front. Accent the lower right corner with a rainbow of jewels to finish. I am really excited to see what all the other design team members have created with Smitty's ABCs! There is so much that can be done with this stamp set, and I bet we are going to see a ton of different styles and uses....so be sure to check out what everyone has done!! How wonderful is this! Love those little rainbow bows. So clever. What a clever use of twine and all it's colors. I love it! You are so incredible good with rainbow colours. Love this one! I love this so cute! This is beautiful!! Thanks for joining us at Wee Memories this week. SO fun! Love all of the colors of twine and rhinestones you combined! Thanks for joining us at Wee Memories this week. This card is AMAZING! I just saw that it was featured on the Two Peas newsletter that came out today too! :) Love, love, LOVE this card! Love what u did with the baker's twine. What a card!! I ABSOLUTELY ADORE this card! That twine is PERFECT, and those rhinestones are awesome! I have such a huge smile on my face looking at this card! Absolutely FABulous, Lea!!! What a striking card! Such a fun card - I love your use of the twine! Thanks so much for joining us this week at Lily Pad Cards!! You always amaze me with your incredible use of color, Miss Lea....this is fantastic...and you must have stock in Doodlebug jewels...I have never seen so many and you have billions of them; so fun....just so fun! 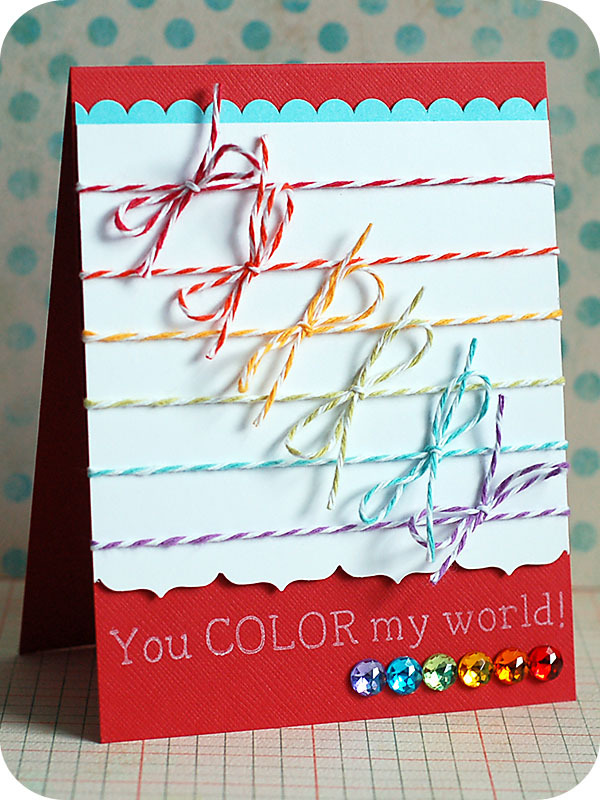 Oh my goodness, I love the fabulous twine on your card! What a fun way to incorporate lots of color. I'm so happy you joined us in the Lily Pad Cards pond! LOVE LOVE LOVE! Cute, Cute, Cute! Thanks for joining us at Wee Memories! absolutely fabulous, Lea!! LOVE this!